On Friday, San Francisco’s Apple Store hosted a different kind of rock star. Cerebral and gifted with a dry sense of humor, Hideo Kojima is the mastermind behind the Metal Gear series of games, a genre-defying stealth tactical espionage enterprise that recently unveiled its first foray onto the iPhone platform. Though he prefers convoluted stories about patriotism and the nature of war to guitars and singing, Mr. Kojima has the international, dedicated and growing following of a modern rock star. This past week he was honored with a lifetime achievement from the Game Developers Conference and capped off the week with an appearance at the Apple Store. Geoff Keighley from Spike TV and host of “Game Trailers TV” moderated the discussion with Mr. Kojima, who spoke through a translator. The first question on everyone’s mind was what was next for the iconic developer. Mr. Kojima remained tight-lipped about the direction of the Metal Gear Solid series, only allowing that we should all “look for an announcement at E3.” Speculation persists whether or not Hideo Kojima will direct the next Metal Gear Solid or if Metal Gear Solid 4 was his swan song. Metal Gear Solid Touch is a departure for the Kojima and his team in that it’s built for a mobile platform. The game’s development was full of challenges for Kojima studios. Initially, the product was assigned to an outside company with Kojima studios overseeing the project but “when we saw finished product we thought it was crap. So we absorbed its parts into Kojima [Studios],” explained Kojima. The game was also intended to stay true to the stealth/espionage roots of Metal Gear Solid, but developing an intuitive set of controls for the iPhone proved troublesome. Keighley cited reviews that slammed the game for being a shooting gallery, and Kojima admitted that his vision for the game had been compromised: “At first we thought this should be a stealth game… There were two parts a stealth and a shooting part ... We mocked up a sample but we thought it wouldn’t work.” With the short playing time of iPhone games, he thought it was too difficult to manipulate the character in an exact way and initial tests proved that players were getting discovered too easily. “So we changed [the] style to touch shooting,” Kojima explains, “I was really nervous,” without the stealth elements of the game intact, this was unlike anything seen in the series previously. When asked about the dearth of cut scenes (a staple and often-criticized element of the franchise) in Metal Gear Solid Touch, Kojima laughed and replied: “No one likes my cut scenes.” The crowd quickly erupted with a mixture of laughs and murmurs of disagreement, and Kojima quipped, “Ok, next game will be only cut scenes,” drawing a chorus of cheers. As a developer of graphically stunning and complex games, he understands that his development for the iPhone is a big step forward for the platform. He hoped that if he “brought this core game to the iPhone” the platform itself might be pushed in a new direction. He aspires to “bridge… the missing link between fiction and everyday life,” and the iPhone provides a unique opportunity to do just that. “I would like to continue creating for the iPhone” he declares. With some humor, he predicts that instead of merely touching Metal Gear’s world, the “next one will be ‘punch Metal Gear Solid’s world.’” As the platform develops and improves, he thinks a stealth game might be possible. In the meantime, Kojima studios is currently constructing another eight stages of gameplay to augment the currently available twelve stages for Metal Gear Solid Touch. He can’t say when they’ll be released but they’ll be free to people who already downloaded the app. Recognizing the shortfalls of the initial release, “touch fighting” will be included in the gameplay, not just “touch shooting.” The trailer depicts Solid Snake, the grizzled protagonist of the series, fighting an adversary in close combat and in the future Kojima hopes to allow players to experience that kind of gameplay on the iPhone. 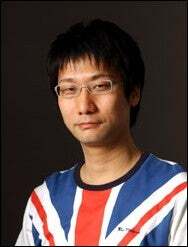 When asked if he would port some of his older titles to the iPhone, Kojima admitted that he personally did not have any plans for it, stating simply “I like to throw away my past.” He compared porting his old games to looking at an old photograph of yourself when you were younger and less attractive. Kojima always likes to look forward, and hopes to continue to develop games in the future. For the iPhone, he cited the lightsaber application and others that took advantage of the unique aspects of the interface as inspirations for future designs. He hopes to do “something crazy” for the iPhone, but we’ll all have to just wait and see what it is. In the coming weeks, look for a review of Metal Gear Solid Touch in the Game Room and an update on the availability of new content.